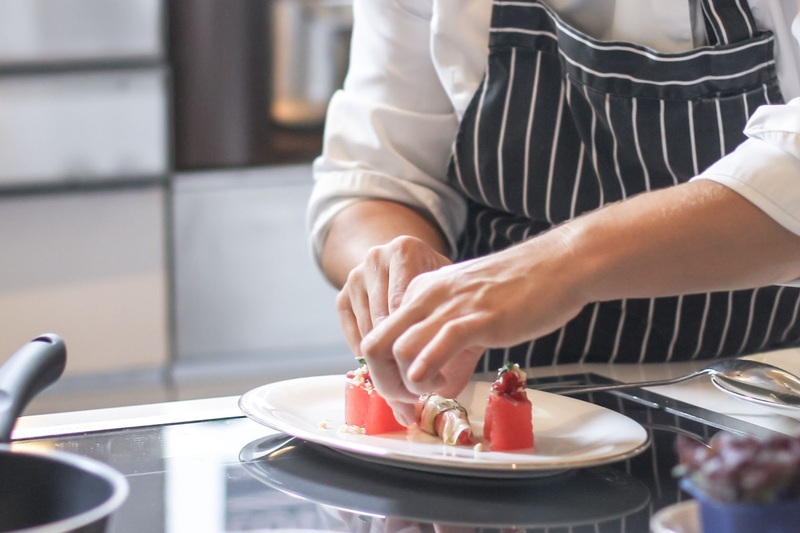 Anantara Siam Bangkok held a week long World Gourmet Festival with notable chef line up like Ana Ros, Bobby Chin, Mauro Colagreco, Kanesaka Shinji and many more. Me and Ken had a chance to fly to the capital of Thailand as part of this impressive culinary event. 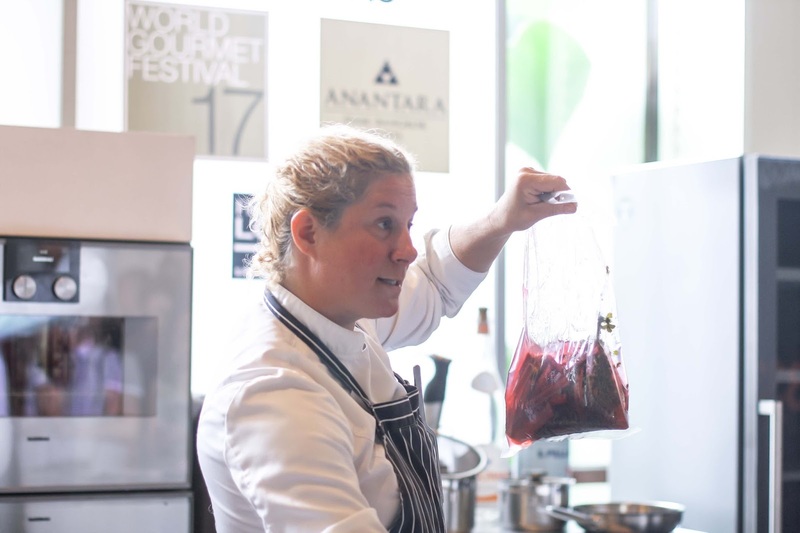 On saturday, chef Ana Roš held a cooking demo that promote cold cooking as a method that reminds us of our eating habit and lifestyle. In the midst of the instant world, there are many ingredients we consume daily that made of preservatives and such. 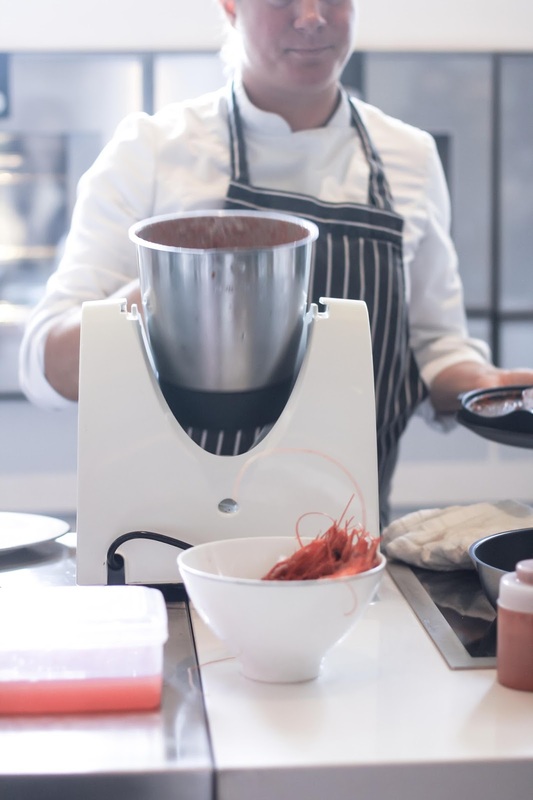 Cold cooking on the other hand, explore the alternatives of food processing method with natural ingredient that can alter the flavour or texture of the raw materials. Chef Ana Roš herself use this method in her restaurant, Hisa Franko in Kobarid Slovenia and is the only woman who joins the "Cook It Raw" chef group. She is one of the stars profiled on the Emmy Award winning Chef's Table on Netflix. 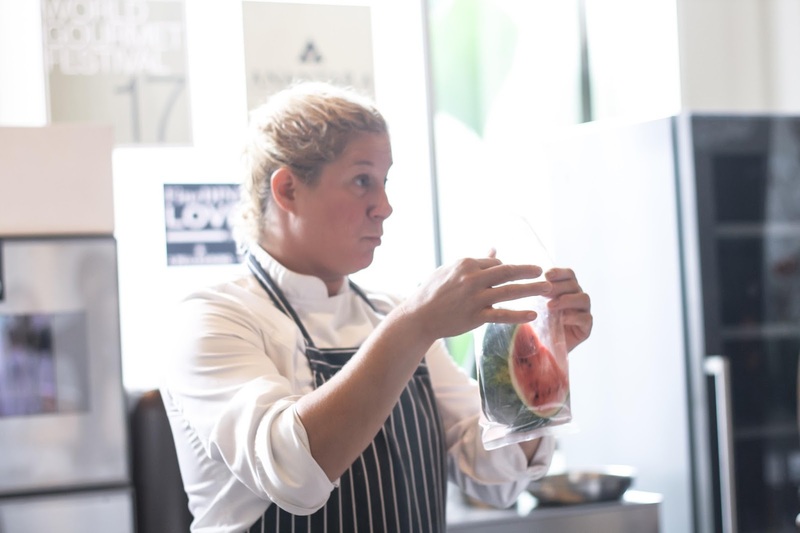 This time, Chef Ana showed us how to process three different ingredients into one through vacuum sealed method. 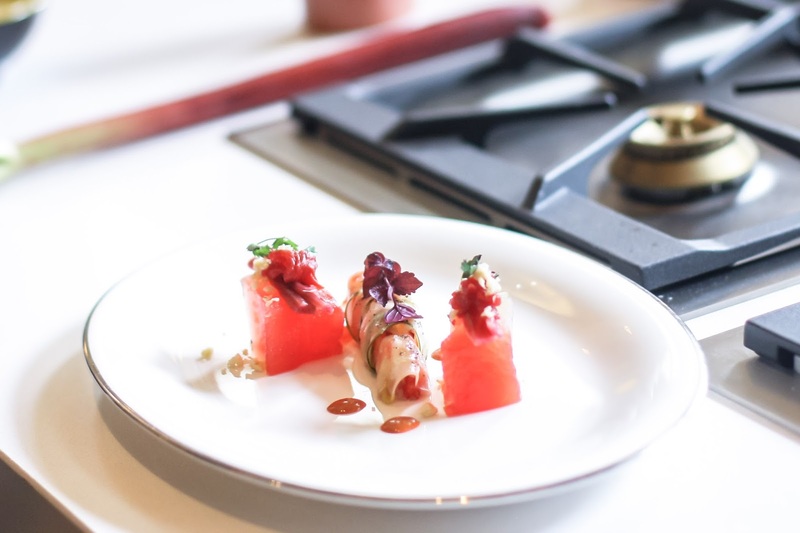 She combined pimpinella leaves, a famous locally produced plant in Slovenia with Rhubarb inside a vacuum sealed bag to extract its aroma and taste. After that, she poured the liquid extract into a bag full of watermelon and resealed the vacuum bag for around 24 hours inside the fridge. This time around, the pimpinella and rhubard extract will be dissolved into the watermelon, thus having the sweetness and saltiness of both plants. After the vacum process, the watermelon will shrink and the water dries down, making it looks dense, similar to a meat texture. 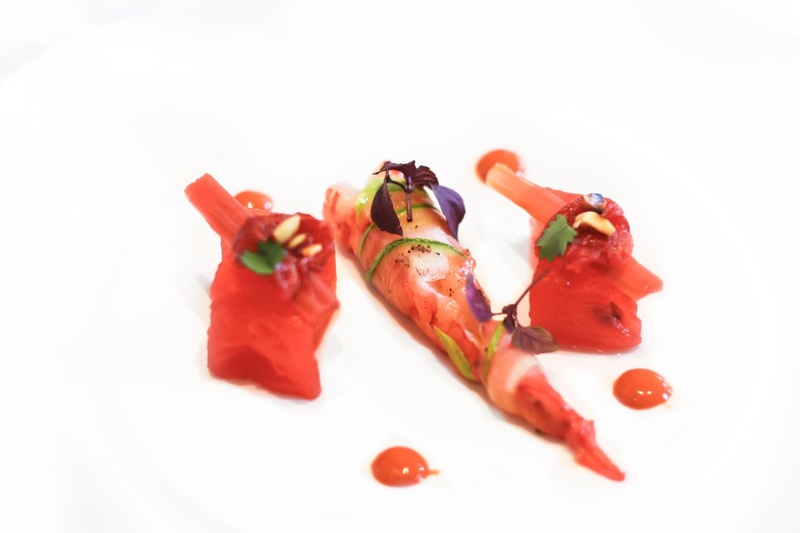 Another ingredient used is Gambero Rosso prawns - Mediterranean wild red prawn. She used it as the base ingredient and for the sauce as well. Chef Ana put the prawns together inside the blender to make the sauce. The raw shrimps are surprisingly rich in flavour! So this is the final result. It is a very nice blend of fresh seafood and raw vegetables and fruit. This cooking process indeed takes time but it does taste so good. It alters the flavour of the fruit and veggies into something more complex. Paired with fresh prawn and avocado, it gives you a variety of chewy texture and savoury taste. Such a nice session to broaden my knowledge about farm to table concept! What a COOL way to "cook"! So exciting you got to see this live! Oh, such a yummy festival! What an amazing opportunity this was! Your dish turned out so incredibly beautifully, I'm impressed! The process was absolutely fascinating to hear about.